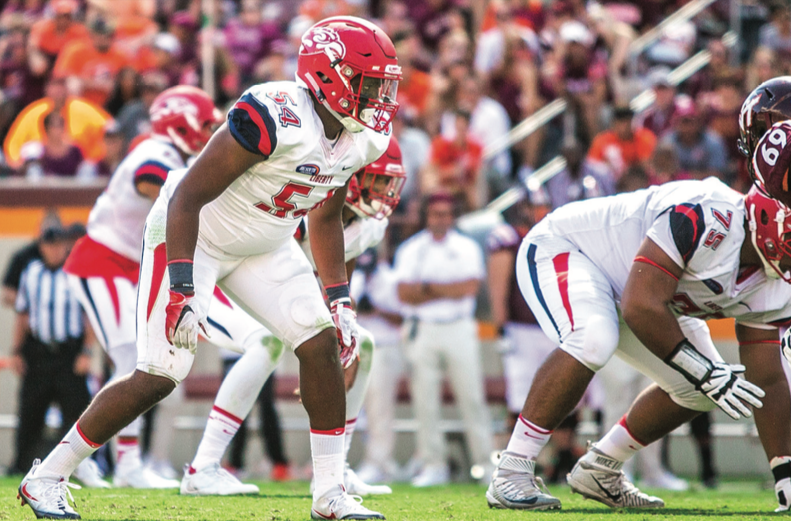 Juwan Wells has raised his game to another level in his first two seasons on the Liberty Flames defensive line. Wells, a sophomore, was named Big South Defensive player of the week after recording 12 tackles in the Flames’ 41-7 victory over Robert Morris Saturday, Oct. 1. Wells finished the game with seven solo and five assisted tackles, according to libertyflames.com. Those 12 tackles represented almost a quarter of Liberty’s tackles for the game. The Georgia native leads the team with 19 solo tackles for the season. Wells’ defensive excellence has filled a void on the Flames defense left by former defensive end, Chima Uzowihe, who donned a Flames uniform from 2012-2015. Uzowihe is the all-time leader in sacks for Liberty and the Big South. He was named Big South Defensive player of the year in 2015. Wells and Uzowihe maintain a friendship and relationship even after Uzowihe’s graduation. Wells says he looks to Uzowihe for guidance throughout the current season. Wells said his current role on the team makes living up to the legacy of Uzowihe a possibility and not just a dream. 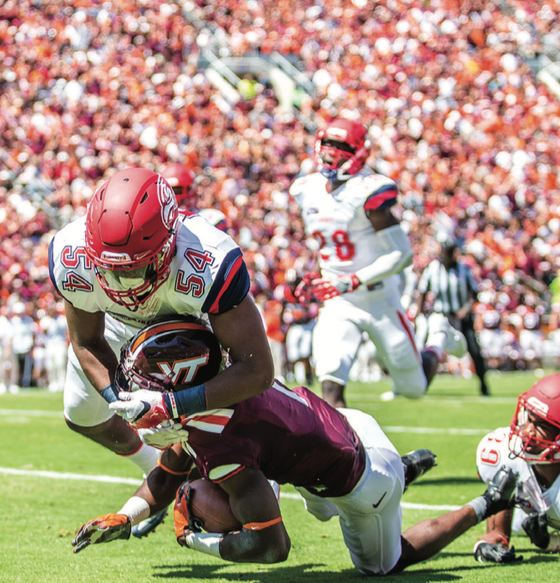 Wells has embraced the larger responsibility of being a team leader this year for Liberty. “As a leader on the team, I always want to hold myself and my teammates responsible,” Wells said. Wells said his experience in games at the end of the season last year built up his confidence for this season. “Getting reps towards the end of last season really helped me this year,” Wells said. Liberty football is not the only football family for Wells. His uncle, Erik Walden, is an outside linebacker for the Indianapolis Colts. Wells says that he and Welden trained together this past offseason in Atlanta. Wells said that it was Walden who showed him how to look at game film in great depth and detail. “He showed me to not only look at the formations, but to look at the personnel and what the players that you will be going against like to do during the game,” Wells said. Wells said his family loved sports and by playing sports he developed his specific love for football. “Everyone in my family always played sports all the time,” Wells said. Wells has aspirations for football both on and off the field. “The ultimate goal and dream is to play football professionally, but if that doesn’t happen then I would love to coach and pass down what I’ve learned to other players,” Wells said. Wells and the Flames continue conference play as the travel to Kennesaw State for the first time ever to take on the Owls Oct. 15. Cockes is a sports reporter. tagged with Big South Defensive player, Defensive lineman, Juwan Wells, liberty flames, Liberty Flames defensive line.